Help Stop La Raza From Making Chicano Park A National Historic Landmark | Stop Obama Now!! 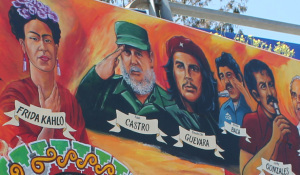 Fidel Castro and Che Guevara They are trying to slip the Chicano Park Preservation Act (HR 3711) through Congress and have it approved in the last days of the Obama presidency. This is an extremely anti-American, revolutionary Marxist / Mexican ultra-nationalist park, which has already been funded with millions of tax dollars for decades by San Diego, California and the federal government. This bill should be laughed right out of Congress, but unfortunately they are taking seriously. Making it a national historic landmark would make it much harder to ever get rid of and much easier for them to obtain federal funds to maintain and expand this site. It officially associates this crazy, Mexican ultra-nationalist site with the U.S. National Park System. This video shared here on Facebook is of Chicano Park Day from last April.